Not to be confused with Constitution Party (United States). A predecessor of the Constitutional Union Party, the Unionist Party, was founded in 1850 by Georgia politicians Robert Toombs, Alexander Stephens and Howell Cobb to support the Compromise of 1850 and reject the notion of Southern secession. This party united Southern Whigs and Democrats under the Georgia Platform, which affirmed Georgia's acceptance of the Compromise as a final resolution to the issue of slavery. However, the party never expanded outside of the Deep South states of Georgia, Mississippi and Alabama and dissolved by the end of 1851. The 1860 incarnation of the Constitutional Union Party united remnants of both the defunct Whig and Know Nothing parties who were unwilling to join either the Democrats or the Republicans. Senator John J. Crittenden of Kentucky, Henry Clay's successor in border-state Whiggery, set up a meeting among fifty conservative, pro-Compromise congressmen in December 1859, which led to a convention in Baltimore the week of May 9, 1860, one week before the Republican Party convention. 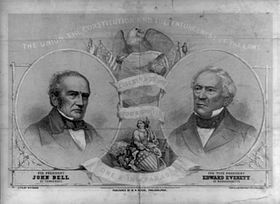 The convention nominated John Bell of Tennessee for President and Edward Everett of Massachusetts for Vice President. In the 1860 election, the Constitutional Unionists received the great majority of their votes from former southern Whigs or Know Nothings. A few of their votes were cast by former Democrats who were against secession. Although the party did not get 50% of the popular vote in any state, they won the electoral votes of three states, Virginia, Kentucky and Tennessee, largely due to the split in Democratic votes between Stephen A. Douglas in the North and John C. Breckinridge in the South. California and Everett's home state of Massachusetts were the only non-slave states in which the party received more than 5% of the popular vote. The party and its purpose disappeared after 1860 as the Southern states began to secede, though the party remained active in Congress until the end of the Civil War. Bell and many other Constitutional Unionists later supported the Confederacy during the Civil War, but backers of the party from north of the Carolinas tended to remain supporters of the Union. Constitutional Unionists were influential in the Wheeling Convention, which led to the creation of the Union loyalist state of West Virginia, as well as in the declaration of the Kentucky General Assembly for the Union and winning Congressional elections in Kentucky and Maryland in June. In Missouri, many of the party joined the new Unconditional Union Party headed by Francis P. Blair, Jr. and remained active in that state's efforts to remain in the Union by overthrowing the elected government of Claiborne Jackson. Everett supported the Union and in 1863 gave a speech at Gettysburg before Lincoln's famous Gettysburg Address. ^ Schott, Thomas (1996). Alexander H. Stephens of Georgia: A Biography. LSU Press. pp. 129–132. Blum, John M.; William S. McFeely; Edmund S. Morgan; Arthur M. Schlesinger, Jr.; Kenneth M. Stampp; C. Vann Woodward (1985). The National Experience: A History of the United States (6th ed.). New York: Harcourt Brace Jovanovich. pp. 344–345. ISBN 0155656643. Wikisource has the text of the 1905 New International Encyclopedia article Constitutional Union Party.